How/what do you pack on LONG trips ? I collect HD t-shirts, and I pick them up as I go along, so I also have those to wear. If you're like many riders, you probably also pickup a few HD t-shirts for your riding buddies also. In a pinch, you can also wear those too! 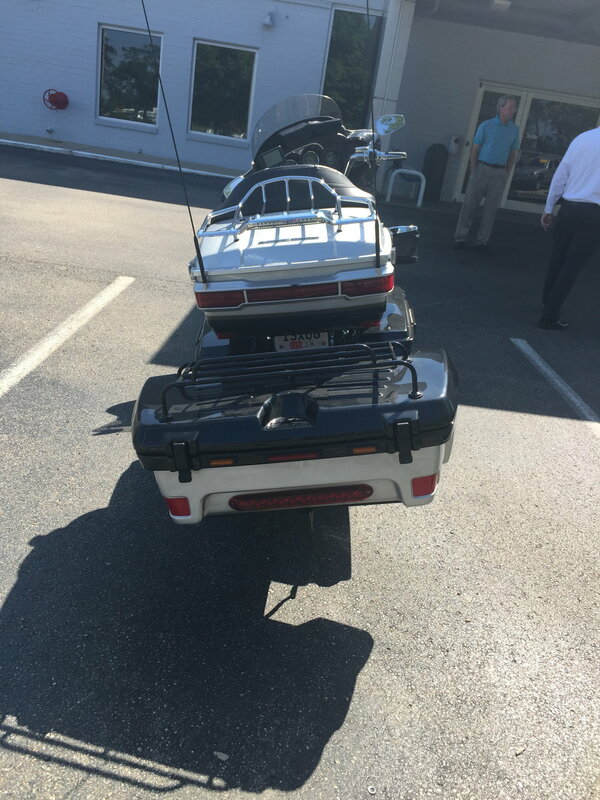 If you go the way of a luggage rack in the trailer hitch make sure anything heavy that you have goes in the saddle bags or tour pack. You think the weight on the tour pack is bad, overload the cargo holder from the hitch, your front end gets really light in a hurry. I have this trailer hitch box, it offers just enough extra space and an additional luggage rack but I only pack the lightest bags in there. If you go this route move your rain suits and the like to the rack and keep the weight in the saddle bags. Where did you find/buy this luggage box and rack? I am somewhat of the mind of its better to have it and not need it than to need it and not have it for the most part, but have been trying to break that mentality on bike trips. If I'm going to be staying in hotels, I don't take too much extra stuff. If I'm camping though I do seem to take a lot of stuff. On clothing, I generally only take one extra pair of jeans either for both hotels and camp trips. A couple more shirts though because they seem to get dirtier quicker. Do about 4 pair of underwear and maybe 3 or 4 pair of socks. On my first trips I was lugging along a bike cover and security chain because I had a bike get stolen once and it had me paranoid about it happening on the road. Now both my bikes have security and a remote pager and I'll just take a disc break lock. Maybe for my next trip I'll try to gather everything before I start packing and take a pic so I'll know what all I generally take. I also do long trips with my wife on a 08 u/c , got tired of all the weight and digging for stuff. We bought a small AMERICAN MADE trailer from mini trailer in oklahoma . and cannot be happier , it towed at 80 mph with no issue , went to wyoming and back , would never go with out it . We are leaving in may for a trip thru the south then cali then the north west and the rockies will be gone for 4-6 weeks . I will send you a picture. ENJOY THE RIDE !! !